At the bottom is the spinach. 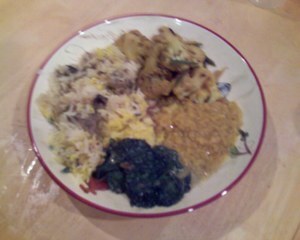 Proceeding clockwise from there: the biryani, cauliflower, and daal. Most of the recipes - the daal, the spinach, the cauliflower, and the raita - came from one slim little cookbook that I love, Madhur Jaffrey's Simple Indian Cookery. I've made many recipes from this book in the past and they always come out wonderful. (The first time I cooked from this book, I made the rogan josh, which we found a little fiery using the full amount of cayenne. When I relayed that to my Trinidadian-desi ex-friend, she said, "Really? I found the recipes in that book a little bland.") The payasam and lassi recipes came from the internet, and for me were probably the highlights of the meal. The saffron rice was my own creation, just simple basmati rice with saffron, peppercorns, mustard seeds, and cardamom pods thrown into the water while cooking. The biryani was the real adventure, and the recipe came from the most ridiculous source. Hyderabadi biryani is a festival dish, descended from dishes served at resplendent feasts in the Mughal courts. To prepare it, I slowly stewed some lamb with onions, coriander leaves (cilantro), mint, and a mixture of spices. Some lightly spiced basmati rice was prepared separately. To assemble the dish, I placed alternating layers of rice and stewed lamb in a deep dish, decorating the top layer of rice with saffron milk. It looked gorgeous, and the layered structure did make for a dramatic presentation. The ridiculous source of the recipe? It's Shabana Azmi's favorite, of course. The recipe came from a fluff piece I came across via Google News some months ago, in which a food reporter asked my favorite Indian actress what she liked to eat, and extracted a recipe from her for publication. I consider this meal a dry run, so that I will be ready when Shabana ji comes to dinner. You will be amazed at the choice!